Here are some basic guidelines to help you get started with photographing Alaska’s wildlife. 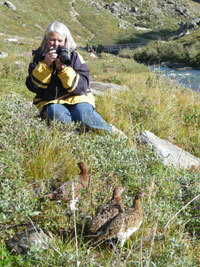 It’s good to learn about your camera and the habits of Alaska’s wildlife before you arrive. That way you’ll get some great shots and both you and the animals you’re photographing remain safe. While we refer specifically to digital photography in this section, many of the tips are applicable to print photography as well. For more information about shooting specific types of animals, download the Alaska Digital Wildlife Photography Handbook (PDF 607 kB), published by the U.S. Fish and Wildlife Service. If you are planning on a guided tour, SeaGrant Alaska has some tips for photographers (PDF file 2,650 K) to help you get the most out of the experience. Be an ethical wildlife photographer. Follow the "wildlife viewing ethics" guidelines on this website whether you have a camera in hand or not. Turn off your flash and your camera's beep settings to lower the risk of startling your subjects. Remember: no photo is worth endangering the life or health of wildlife! Familiarize yourself with your equipment before you head out in the field. Experiment with your camera's manual modes-try adjusting the ISO, exposure compensation, arid white balance to see what effects you can get beyond the camera's automatic settings. Practice before your trip by taking photos of birds at your birdfeeder, pets in the park, or ducks at" a local pond. For handheld pictures, practice tracking objects in motion with your camera, at both low and high zoom settings. This will help you track the flight of birds or the motion of mammals for action shots. Pack your camera bag with extra batteries, lens cleaner, extra memory cards, a notebook for notes, and your instruction manual. Bring a tripod or monopod to help stabilize your camera for clearer images when you are onshore. When ferries are underway, boat movement will mean you'll need to handhold your camera. Onboard a moving vessel, try increasing your shutter speed for crisper shots (shutter priority mode is often indicated with a running person on automatic cameras). Try using "continuous shoot" mode to get a series of rapid-fire images to choose from. Study your subjects to learn their movement patterns. This can help you set up the best shots. For example, whales often surface several times before making a deeper dive. If you study the timing of their breathing and their direction of travel, you can predict where they will next surface and be prepared to take the photo. Observe animals from a safe distance without changing their behavior. Be especially careful around females with young, spawning, and nesting areas. If you do your research, you’ll learn when an animal is signaling that you are too close. At that point, you should either sit or stand quietly or move slowly away. You may lose your picture, but you will be safe and so will the animal. Wear natural colors and avoid lotions or scents. Relax your muscles and do not stare. Animals can sense your emotions and may feel a direct stare is a threat. Approach wild animals slowly and quietly and avoid sudden movements. Never chase wildlife for photos. Never feed the animals. Never throw rocks or things to get attention. Always leave space for an animal to get away. Animals often return to the same sites-use this fact to prepare for a shot. For example, a bird will often return to the same perch after flying out to forage or to declare its territory. If you become familiar with its habits, you can pre-focus on the perch and be ready for its return. Some subjects are best captured with motion pictures. For example, although bow-riding Dall's porpoises are hard to catch in a still shot, a short movie can capture their speed and grace. Remember, too, that in some ways a camera can distance you from the experience of wildlife viewing. Take some time to just be “in the moment:” Put away your camera, watch, listen, and feel, and take photos with your mind.